We’re proud to announce that we’ve recently released a beautiful new Sales Reporting app that’s specifically designed to assist sales teams. Before this app, there weren’t many options in terms of analyzing your sales data in a mobile format. The whole point of the app is for sales team all over the world to customize the app for their brand, while also closing deals faster, regardless of where they are at the time. The great part is that so many salespeople are traveling while doing their jobs. Therefore, it’s essential for them to have synced access to sales numbers at all times. 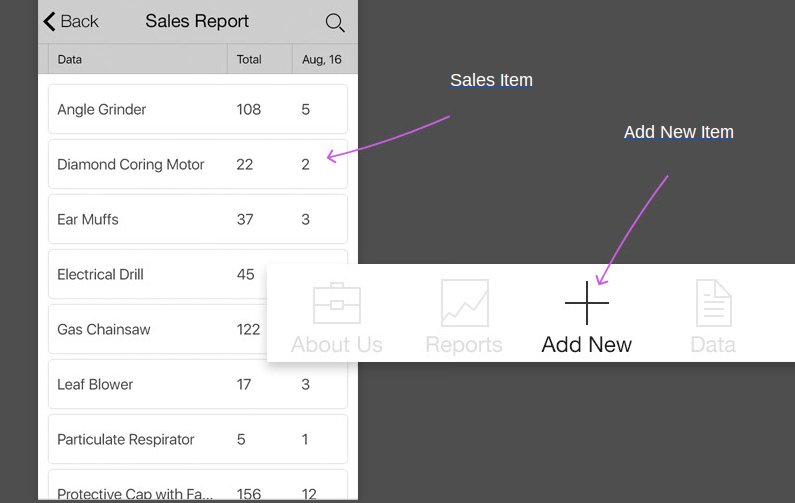 How Can a Sales Reporting App Help Your Company? The primary reason a company would use the sales reporting app is to turn more prospects into customers. The ability to view monthly sales data and graphs determines which of your products and services are catching on with customers. In addition, you can identify which of the prospects are coming close to buying, while also making changes for current customers who may not be buying as much as they use to. Who Should Consider Trying the App? We like the app for just about any type of sales team. However, it particularly works out for small businesses and entrepreneurs, since these people are constantly grinding and moving around to make the next sale. Therefore, it’s a particularly valuable app for entrepreneurs. The main way to include new items in your app is by hitting the Add New button, then inserting all of the product details. With this, you can name the product, then mark how many total sales have already been completed. In addition, you can see the sales data from a single month. So, when evaluating all of the products on your shelves, it will reveal your monthly sales for a product, the total sales, along with the name. The best part is that you receive a complete list of all the items you’ve made sales for. Therefore, you can identify which of the products aren’t selling well, along with the ones that are the big sellers. The interface is one of the simplest we’ve come up with, so we expect salespeople of all experiences to embrace the app and use it as one of their daily tools. This is one of the features I like the most, since it keeps the entire organization up-to-date, regardless of where everyone is located. For example, if you have one salesperson taking meetings along the east coast (while the business is in the midwest,) that salesperson can mark off whenever they make a sale. This keeps the rest of the team happy, and can bring some motivation to those who are struggling on the team. Not to mention, the bookkeeping stays in check. Looking at a list of your sales information generally works fine, but the true value comes about with a graph. 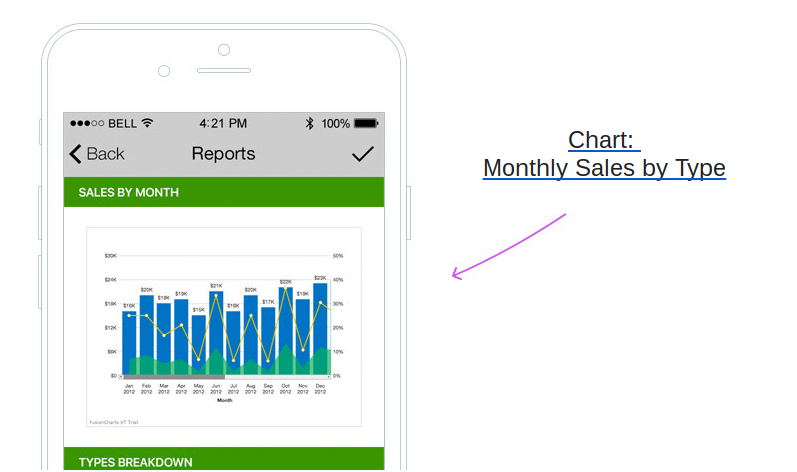 With the sales reporting app you gain access to a beautiful chart, breaking down your monthly sales by the type of product or service. This way, the app lets you see sales trends for your entire company, and can give you the information needed to make adjustments in the field. One of the main questions sales people have is whether or not all of the sales information on a program is synced and updated. 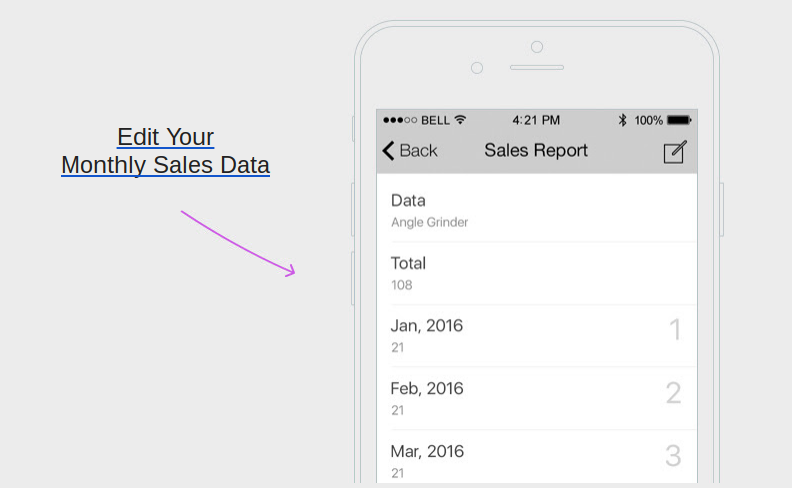 That’s the case with the new iBuildApp sales app, so all you have to do is create a Google Sheet and insert a few formulas for real-time charts and sales data. Overall, the sales reporting app offers a wide range of features for your sales team, so give it a try, and let us know if you have any questions in the comments section below. Also, you can check out the app right here and start improving your sales processes within minutes.